Mark Rucker/Transcendental Graphics/Getty Images Tobacco cards were used as stiffeners to protect cigarette packs. About 370 million were produced. The Monster had taken control. My wife Tejal held a torn manila envelope, displaying the contents before me. 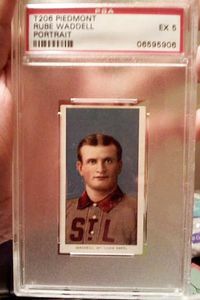 Within a welded slab of hard plastic was my T206 Piedmont Rube Waddell baseball card. "You told me you stopped." "I did. I ordered these off eBay months ago. They must have just sent them." I had actually bought them just a week before. 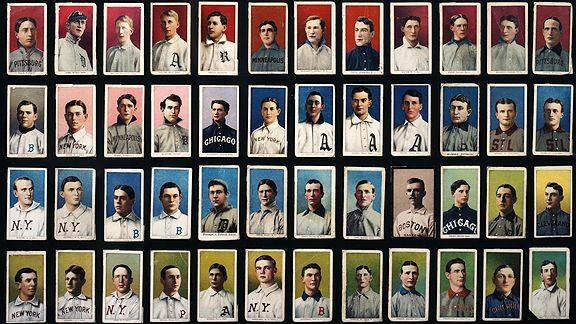 I'd become addicted to vintage tobacco cards, specifically the T206 set issued by from 1909 and 1911 by the American Tobacco Co. To card aficionados, it's the most important sports card set in the hobby of collecting and one of the most valuable. Known as the Monster, the set features at least 524 cards with more than 16 different tobacco brand backs, creating a set that has thousands of variations. The Waddell was my latest addition. Amar Shah The newest addition to the T206 tobacco card collection. My wife asked me how much I paid. I told her $30. She threatened to feed the card to the evil dog that lived downstairs. I confessed and told her it cost $350. She left without even looking at me. I had an inclination to chase after her, but I was distracted by the card. Like Gollum, I picked up my precious card, and stared at it. According to Michael O'Keefee and Teri Thompson, authors of "The Card: Collectors, Con Men and the True History of History's Most Desired Baseball Card," 370 million T206 cards were produced of which about 1.6 million remain in circulation today. The most well-known and coveted of the lot is the Honus Wagner. Known as the Holy Grail of cards, the Wagner has grown in mythology over the years. The highest-graded Wagner specimen, one that was owned by Wayne Gretzky and former Los Angeles Kings owner Bruce McNall, sold for $2.8 million in 2007 to Arizona Diamondbacks owner Ken Kendrick. Even the lowest condition Wagner sells in the six figures; one was recently sold by a group of nuns. It's also the very card I held when I was 8 that initiated my lifetime fascination of the T206 set. I acquired my own Wagner in a third-grade neighborhood trade, swapping a 1988 Topps Cory Snyder and Joe Carter. I was moralist at age 8 and the story of Wagner stopping production of the card because he didn't want to encourage kids to chew tobacco inspired me. I also knew the value of the card and my friend Jamie didn't. When the trade was finalized I thought I'd retire financially and spend the rest of my life playing "Double Dragon" on Nintendo. Alas, when I went to a local baseball card shop to cash in my millions, the dealer laughed and told me my card was a reproduction. And not a good one. Instead of a wad of hundred dollar bills, I was given a complimentary pack of Garbage Pail Kids. After that childhood trauma, I learned everything I could about the T206 set. I swore when I grew up I'd have them all, including the Wagner. As I got older my passion for those richly illustrated vintage miniatures chronicling the dead ball era increased. In college, I would frequent malls on weekend mornings when card dealers would set up booths and flip through their albums looking for a cheap T206 common. That's when I bought my first, a dog-eared, poorly conditioned Ed Reulbach. The Cubs' star pitcher, who once pitched two shutouts in one day, cost me $20. Unfortunately, that card and the rest of my childhood collection were stolen a few years ago from my parents' home. So, perhaps it was a quarter-life crisis -- I was turning 30 -- but I began to get that itch to start collecting again. The urge to buy something overwhelmed me, especially every morning when I would pass the Beverly Hills Baseball Card Shop going to work. During lunch, I would skip meals and drive to the shop where I would peruse the glass and bug Zack and Matt, the owners. One weekend afternoon I brought Tejal with me. She got bored within the first two minutes and I was so afraid to buy anything in her presence. I waited until she left to put change in the parking meter before I tried purchasing a $6 pack of Topps Allen & Ginter. Didn't happen. Tejal came back in hysterics, waving a parking citation. A few weeks later came the T206 tipping point. Tejal was working all day and I had the entire day to myself. As soon as she was out the door, I was jonesing to buy something. In a mood of '90s nostalgia, I asked Zack behind the counter at the card shop if he had a box of '92-93 Upper Deck basketball. I'd spend the $40, go home and perhaps pull a Shaq rookie. 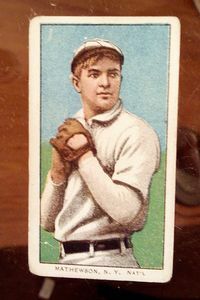 Amar Shah The White Cap Christy Mathewson card set an obsession into motion. As he went into the back to look for a box, I browsed the case full of '50s and '60s Topps and Bowman singles of Mantle and Mays. Then the Proustian moment materialized in the form of the Big Six. Pressed in a plastic holder at least two inches thick was a T206 White Cap Christy Mathewson. When Zack got back I asked if I could see the card. He unlocked the case and handed it to me. I asked how much. He told me $400. I didn't hesitate. Sold. I asked if he had anymore T206s. Indeed, he did. An hour later, I awaited the total from Zack. 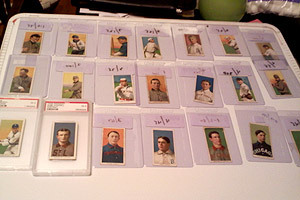 $2,570 for 19 T206 cards, including 16 Hall of Famers such as Eddie Collins and John McGraw. The Upper Deck box was thrown in for free. Irrational exuberance blocked any sense of rationality as I handed him the credit card. I had just spent two months of rent on 100-year-old artifacts of men I'd never seen play, but the only remorse was thinking I should have bought the Ty Cobb, too. I left the store in a state of delirium. When I got home I planned a clever cover-up, cleaning the house and doing the dreaded dishes. I hid my new treasures in a "Star Wars" tin. When Tejal arrived, she was thrilled and touched by the immaculate pad. All was good in the Shah household. Or so I presumed. A week later, racked by guilt and a newly arriving credit card statement, I manufactured an argument with Tejal, whereby I confessed to buying the cards, but as an investment. I told her putting our retirement savings into tobacco cards was more lucrative than a 401K or Roth IRA. I was immediately exiled to the couch in the living room. Instead of reforming my ways and selling the cards, I ended up buying more. The following week I was back at the card store. I dragged along my friend Jorge to prevent me from another splurge. Yet I still managed to spend $500 on T206s, including a marvelous Three Finger Brown. My eBay dependency started. I'd get so caught up in the moment that I didn't realize I spent $100 on Al Burch, a .254 lifetime hitter. I also discovered a newly published book called "The T206 Collection: the Players and their Stories" by Tom and Ellen Zappala, which profiled all the T206 players, including their feats and eccentricities. I found out Burch became a chauffeur after he retired. It was these minute details of these long-lost players such as Johnny Kling, who took off the 1909 season to become World Pocket Billiards champion, or the forgotten great Hal Chase, who would be in the Hall of Fame but was blacklisted for gambling, that kept me fascinated. "It is mind-boggling how many people collect this set for whatever reason," said co-author Tom Zappala over the phone. "It strikes a chord with everyone." Zappala shared my T206 obsession as well, picking up his first card 20 years ago, a Ted Easterly. He's got 350 so far, well ahead of my total of 22. He advised me not to rush into collecting everything at once. Courtesy of Amar Shah The T206 collection is relatively small, although still too large for my spouse's tastes. Zappala couldn't help me convince my wife, though. After Tejal returned hours later I knew I had to reach a compromise with her. She listened patiently as I tried to explain why I bought the cards and why it was worth holding on to them. A moment later, she let me know I had six months to sell them and I was not allowed to buy anything else. She could have done worse. A few months have passed and I still haven't decided what to do with the cards. I haven't bought anything new either. However, I paid a visit to the Beverly Hills Baseball Card Shop recently and flipped through their latest batch of T206s. There was a sweet near-mint Frank Chance for $1,400. I was filled with the clenching desire to buy it. The Monster still had a hold over me. Zack and Matt told me they do layaway plans. I was about to pull out my wallet when my cell phone buzzed. It was Tejal. Amar Shah is a writer and producer working in Los Angeles. He's currently developing a documentary on the baseball card industry. Contact him at gatsbyshah@gmail.com.